What makes Superman super? Is it his array of fabulous powers and his invincible strength? Perhaps, but maybe what actually makes him super is his willingness to protect the helpless and defend the innocent. Yes, surely it is Superman’s moral strength that makes him worthy of the title, because he’d still try to save the world even if he could leap tall kerbs in a single bound and the only thing he could shoot out of his eyes was salty water. My point is, please try not to be too disappointed with the powers of today’s game’s eponymous protagonist. 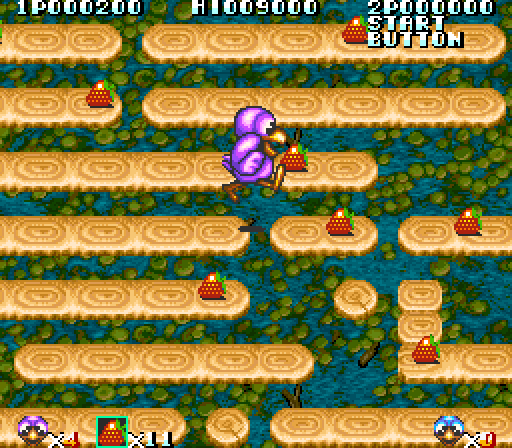 It’s Korean developer Comad’s 1992 arcade game Super Duck! There’s the Super Duck now, looking not much like a duck at all. Barely even bird-like, if I’m honest. If I didn’t already know the game’s title, I reckon I’d have had trouble figuring out that’s supposed to be a bird. It’s all eyeballs and beak! Mostly eyeballs. I can’t help but imagine those swollen eyeballs pressing up against me, and I bet they’d feel like the blister you get when you scald yourself. There, you can have that particular mental image for free. 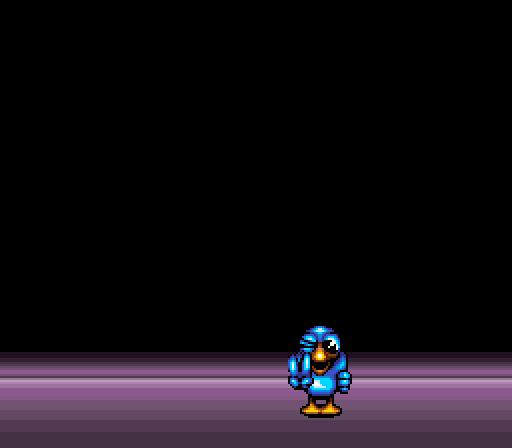 Okay, so we’re playing as a big-eyed cartoon duck, in an arcade game from 1992. I assume it’s going to be some kind of bog-standard hop-n-bop adventure with a cast of fuzzy-wuzzy woodland creatures, correct? Super Duck saves the inhabitants of Gumdrop Forest from the nasty King Heron by using his rainbow power, and so forth. Or perhaps not, because Super Duck goes with a real curveball of a plot. An angel and a human woman fall in love, as sometimes happens. She’s attracted to the angel thanks to the innate goodness that comes from being a servant of the Lord God, and she’s willing to overlook both his lack of external genitalia and the fact that he looks like he’s carved from a block of warm lard. The angel is smitten with the woman’s pretty red hair. It’s a match made in… well, not Heaven, exactly. I think God generally frowns on liaisons like this. 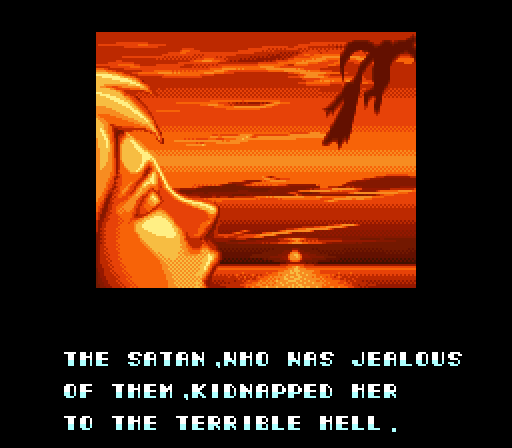 Satan is jealous, and kidnaps the woman. Not just any common-or-garden Satan, mind you, but The Satan. He takes her to a terrible Hell, and I’m not sure whether that means an afterlife where the endless torment is particularly brutal or one that’s terrible because they accidentally ordered marshmallows instead of brimstone and it’s all a bit of an embarrassment to the higher-up demons. “Oh, go on then,” says God. “Go and save her if you must. I don’t want you moping around and bringing the celestial host down. I hope you’ve got a plan to defeat Satan, though.” And the angel does have a plan. Oh boy, does he ever. He calls down a bolt of lightning that transforms him from an angel into a duck. A super duck, yes, but you’d think he’d do a better job of rescuing his beloved if he had opposable thumbs. The only reason I can think of for this transformation is that a duck, being an animal, is incapable of sin and can therefore enter Hell without being condemned to eternal suffering. Of course there are lots of other animals that the angel could have become, so maybe there’s something about the duck that makes it particularly suited to this mission, like it takes place in a breadcrumb factory. The game begins, and it’s not quite what I was expecting but it’s not a million miles away either. 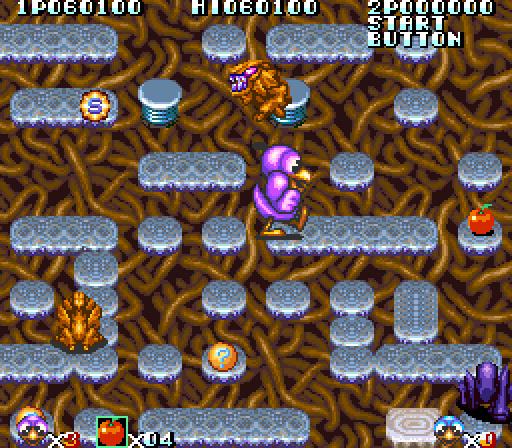 You’re controlling the angel-duck, and your mission is to clear each stage by collecting all the fruits / vegetables in the stage- in this case, those rather succulent-looking strawberries. 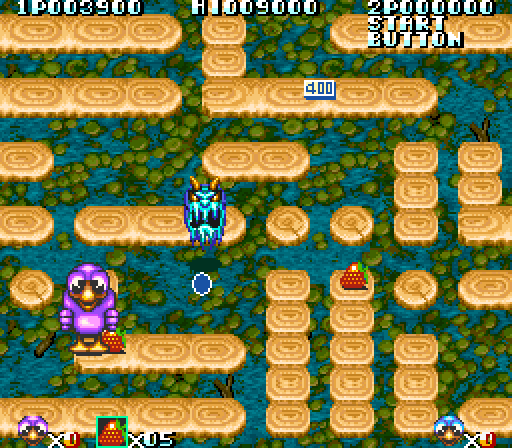 The play area is a maze constructed from lollipop sticks hovering over a pond, so as you can probably tell most of the gameplay is going to revolve around jumping. You can only walk on the wooden platforms and you have to jump between them. You can only jump across a gap of one “unit,” if you get me – so the duck will clear the jump he’s attempting in the screenshot above, but if he tried to jump directly downwards from his landing point he’d fall to his death because that gap’s two “units” wide. Wait a minute, fall to his death? I have two main duck-related issues with this. Number one, ducks can fly. Number two, duck are very good at landing in ponds. If there’s any single animal for which the hazards of this stage should prove negligible, it’s ducks. Okay, so there are also monsters to avoid. They could easily threaten a duck. 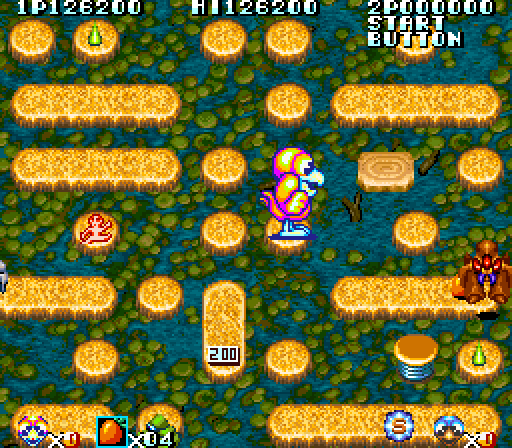 There are two main categories of monsters in Super Duck: the ones that pop up and fire a deadly projectile roughly in the duck’s direction, or the ones that run around the level without a care in the world, uninterested in what the duck is up to but still deadly to the touch. Whether by design or coincidence, the monsters often seem to congregate on the outer peripheries of the stage. It doesn’t feel particularly intentional, but there are always a few fruits you need to grab at the edge of the level and those are the most difficult to reach so maybe the monsters are supposed to move outwards and block your path. Once you’ve grabbed every piece of fruit, the stage ends and you’re whisked away to the next one. 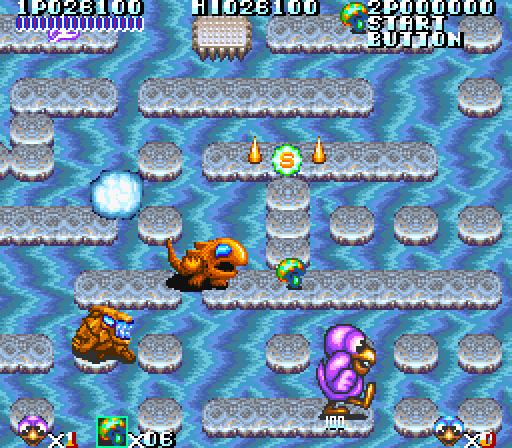 There’s a different layout of platforms to contend with and the background usually changes, but other than that the gameplay’s the same, and I don’t think it’d be too harsh to say that if you’ve played one stage of Super Duck you’ve played ‘em all. If I was comparing Super Duck to another game I suppose Pac-Man would be the obvious choice, although because both games are about jumping between floating platforms from a sort-of-top-down perspective, Evil Stone would be a more accurate comparison. 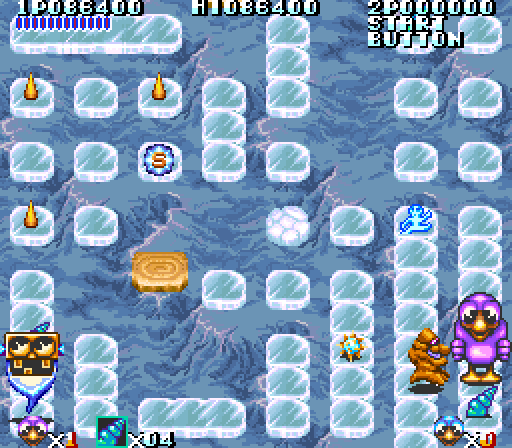 Thankfully this game never gets anywhere near as frustrating as Evil Stone. As a lava dragon that I’m sure I once saw in a Gradius game flies around the screen, I’m reminded that this game is called Super Duck. So far I’ve seen plenty of duck but very little super, and I’m definitely not confident about my chances of defeating this dragon. Can the angel-duck even defend himself? Well, not at first, but there are mysterious orbs that appear on each stage and if you collect one of them you do gain a method with which to fight the monsters. Is it laser eyes? The wrathful judgement of Heaven itself? A pointy stick? You get farts, that’s what. Once you’ve collected the orb you can fart at the monsters, releasing a cloud of gas that paralyses your foes and also lingers wherever you deposit it so that any other monsters that wander into the miasma will also be stunned. You know what? I’ll take it. It beats being completely defenceless, although I feel weaponised flatulence is rather tarnishing the spiritual perfection of the heavenly host. I probably should have asked Uriel if I could borrow his flaming sword before storming the depths of Hell. I should also point out that your farts have limited ammunition. You’d think that “eating all the fruits and vegetables you can” being the point of each stage would take care of that issue, but apparently not. 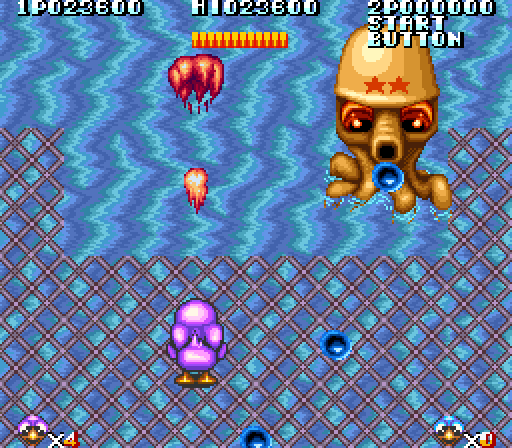 Stage five is a boss battle, and Super Duck suddenly switches focus from jumping-based maze game to a top-down shooter than feels a bit like Space Invaders except there’s only one enemy and it’s a huge octopus. Your farts aren’t going to cut it during this battle, but not to worry – the duck can now spit fireballs out of his mouth. Only against bosses, mind you. Yes, we’re all disappointed that the duck can’t breathe fire all the time – a power I would definitely classify as “super” - but it would make the non-boss stages far too easy so I can see why they limited it to the boss fights. As for fighting the boss, it works exactly like you’d expect it to after seeing the screenshot above. 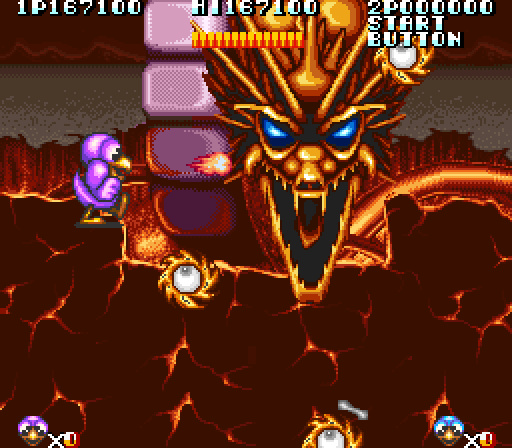 The boss fires downwards at you, you fire upwards at the boss. Try to avoid the bosses projectiles, keep hammering the fire button, grumble under your breath a little because the boss’ health bar is just long enough to take the fight into tedious territory. At least the boss looks cool. It’s hard to go wrong with a massive octopus monster, honestly, although I’m not sure what the two stars on its head represent. Maybe if you gather another six of these things together you can make a wish. After the boss it’s back to the regular gameplay, and Super Duck continues in much the same vein for the rest of its duration. Collect the fruit, dodge monsters, boss fight every few stages, try to cropdust as much of the stage with your potent duck farts as possible. It’s not bad, if a little generic. A small amount of new elements are added as you rattle through the levels, the most important being collapsing platforms that crumble away if you don’t immediately jump off them, moving platforms and spikes that are deadly to the touch but can be jumped over (presuming you’ve got somewhere to jump to on the other side). Like I say, it’s not bad. The developers had a very simple concept and they just about managed to pull it off in a way that I can’t complain about besides the obvious complaint that it’s not especially interesting or innovative. 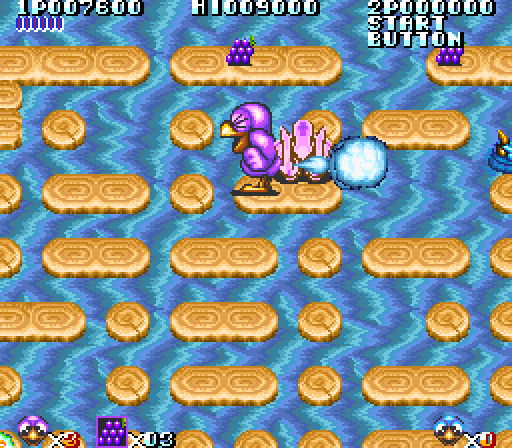 I sometimes had trouble landing jumps going “up” or “down” the screen because the duck’s wide sprite can make it a little difficult to judge whether you’re lined up correctly, and your deadly farts can be awkward to use because obviously they come out of the back end of the duck so you have to turn away from enemies to spray ‘em. Other than those minor issues, though, Super Duck works as intended. 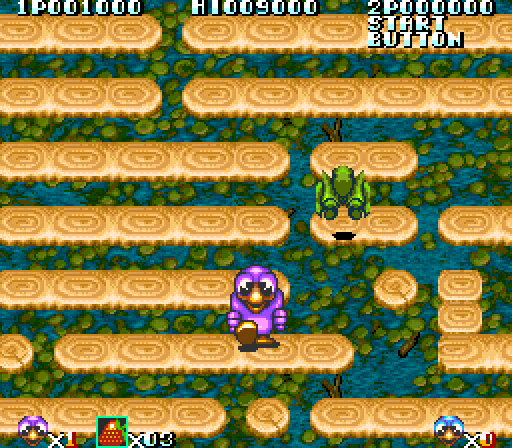 This stage has a background composed of either writhing worms or writhing spaghetti. Pasta or worms, whatever it is it’s definitely writhing so maybe the duck has reached one of the uppermost layers of hell already. Yep, things are getting hellish, what with the skeleton dragon and the skeleton background. This boss is a lot like the octopus except it fires a spread pattern of bones that are far easier to avoid than the octopus’ bubbles, making this a much easier although no less tedious fight. All the bosses are like this. They sum Super Duck up nicely: repetitive, mechanically competent, sometimes interesting to look at. 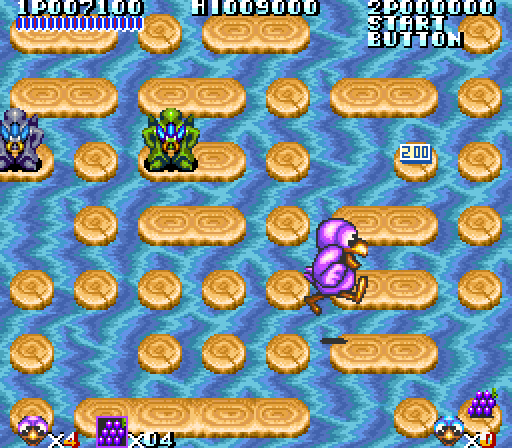 A lot of the enemies in Super Duck do look interesting, which is one of the reasons I’ve stuck with the game this long. 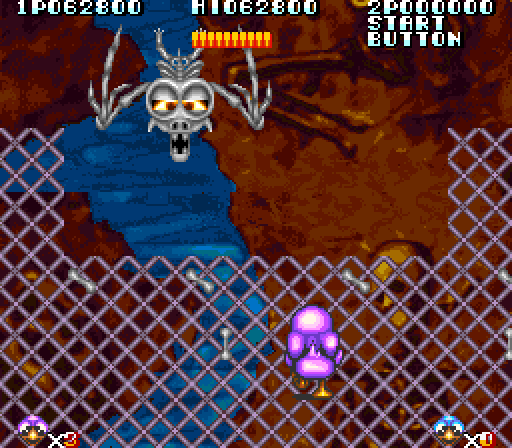 I’ll cut a game a lot of slack if it has fun monster designs, and holy bouncing skeleton on a pogo stick this stage has bouncing skeletons on pogo sticks. Image the noise these things must make. Boing rattle boing rattle, like someone pouring dominoes onto a trampoline. Also making a real claim on a special place in my heart are the ghosts that you can see in the bottom-left of the screenshot above. Yeah, the ones with the robot face. Not enough robot ghosts in popular culture, if you ask me. Or cyborg ghosts, if you must insist that there has to be a living component that must die before a ghost can be born. It’s such a weird design that I can’t help but be drawn to it, although my affection for the blockheaded spirits is slightly tempered by the fact that their massive noggins can make it difficult to see what’s behind them sometimes. Also in this screenshot: a tiny blue man, on the right-hand side of the screen. Those aren’t enemies. They’re... items, I suppose. When you step on them, they jump to an adjacent square. If you chase them around for long enough, copying their movements, eventually they’ll turn into… a points bonus. That’s something, I guess. I’d have preferred a cigarette lighter so I could really put the duck’s farts to good use, but points are nice too. The next set of stages are much the same as all the rest, but I did manage to collect a power-up that made the duck invincible. Not just against monsters, either: he’s also immune to gravity when he’s powered up, so you can simply ignore everything, collect as much fruit as possible and jump across otherwise impassable gaps by standing on empty air. I doubt it was intentional but doing this has a real Looney Tunes quality to it, so that’s nice. Also, here’s my top tip: the invincibility you get after losing a life also makes you briefly able to stand on nothingness, so use that to your advantage whenever a monster manages to bump into you. 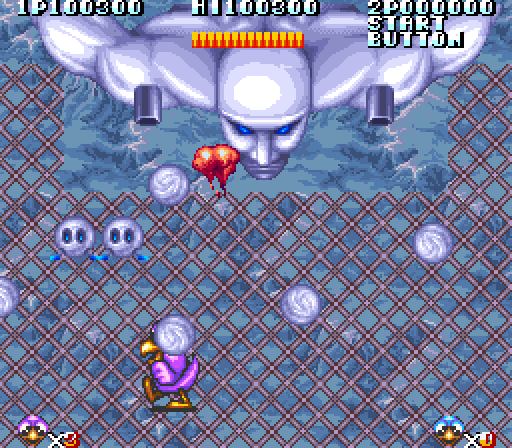 High above the barren lunar surface, the duck does battle with yet other boss that fights by firing projectiles downwards. 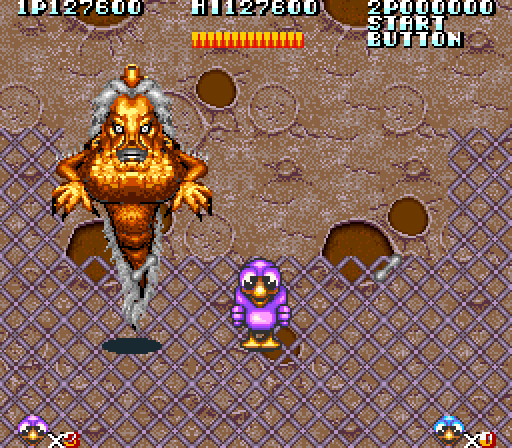 This boss appears to be a floating pile of excrement that went to the barbers and said “give me the Albert Einstein, please.” Amongst all of Super Duck’s weirdo enemies, this thing is uniquely unpleasant to look at, especially in the face. Two thumbs up from me, then. Give this thing it's own spin-off game. 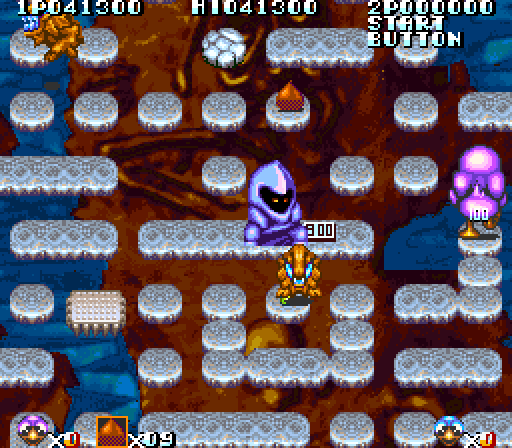 You might also notice that unlike the previous bosses this thing isn’t confined to the top of the screen, and will instead move down to your half of the screen. This does add a little extra pressure to the fight, but it also means you can move onto the two “prongs” at the sides of the screen and fire sideways, which is often the best strategy for avoiding the boss’ projectiles. 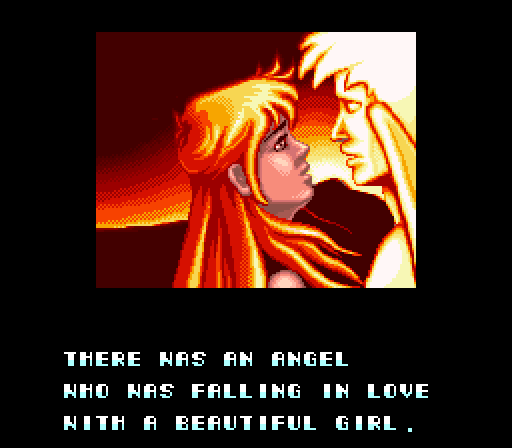 By the way, between each world the game’s been chucking out these reminders of the whole “angel rescuing his beloved from Hell” concept. 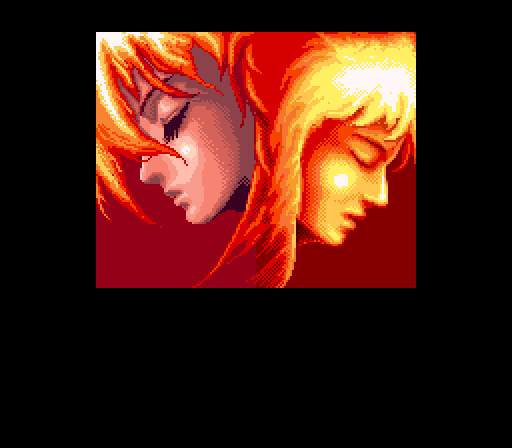 All of them are some variation of the hero and his lover looking tense and serious, as well you might if you or someone you care about had been kidnapped by The Satan, but you might be thinking that the “hell” bits of the game don’t really mesh with the “cutesy duck eats apples” motif found during the gameplay. Well, I think I have an explanation for that. 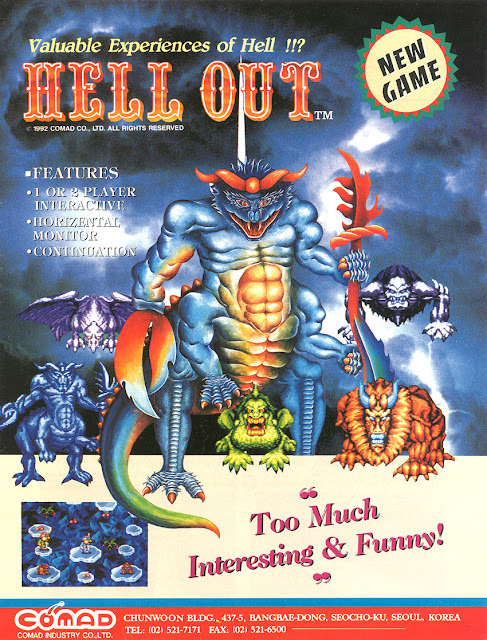 This is the arcade flyer for another game by Comad called Hell Out. Let’s get the obvious facts out of the way first: “valuable experiences of hell!! ?” might be the greatest tagline ever, and “too much interesting and funny” would be the entirety of my profile if I ever decided to try internet dating. Those facts aren’t important here, though. Take a look at the screenshot on the flyer and you’ll see that it looks a lot like Super Duck. Lots of small platforms, fruit to collect, and even some of the same monsters… although the player characters are dumpy little humanoids instead of ducks. I’ve seen it suggested that Super Duck and Hell Out are the same game, but it’s almost impossible to find any information about Hell Out that isn’t on this arcade flyer so it’s hard to say for certain, but what I think happened was this: Hell Out was the original version of the game, with the same plot and general gameplay… but the theme was later altered for some reason (possibly because of the Korean ratings board or for an overseas release that might not have happened.) 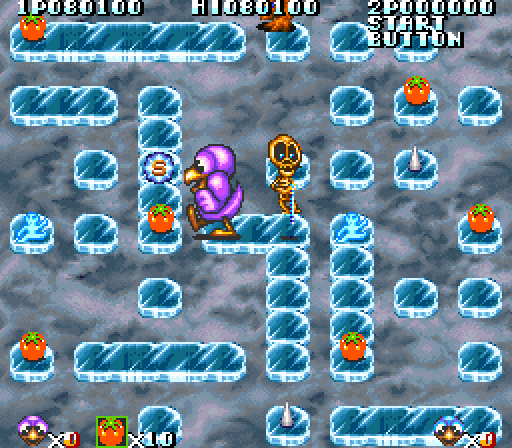 If that is the case, there were definitely some big changes to the gameplay because unlike in the screenshot on the flyer, Super Duck’s platforms conform to a grid and the fruit is always on a platform rather than hanging in mid-air. Or perhaps Super Duck is a prequel / sequel. Who know? Maybe one day more information on Hell Out will surface, but for now it will remain a mystery. All I’ll say is that it’s criminal a title as good as “Hell Out” has already been taken. 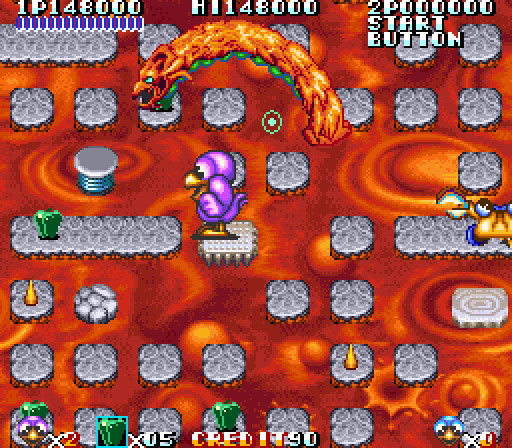 Speaking of Hell, Super Duck’s final few stages definitely have the look of a classic Hell-themed world to them. Lots of lava, I mean. Molten rock everywhere, fiery chasms, a smattering of spikes. Just what you’d expect, and I’m happy to report that the gameplay hasn’t become hellish. 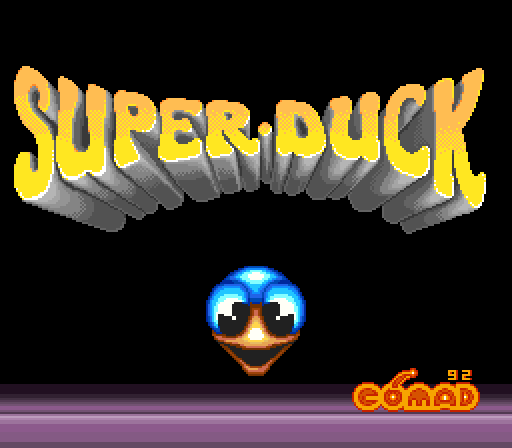 It’s definitely a lot more difficult than it was at the beginning of the game, but on the whole Super Duck has a far more gentle difficulty curve than most arcade games and for that I’ll give it a lot of credit. 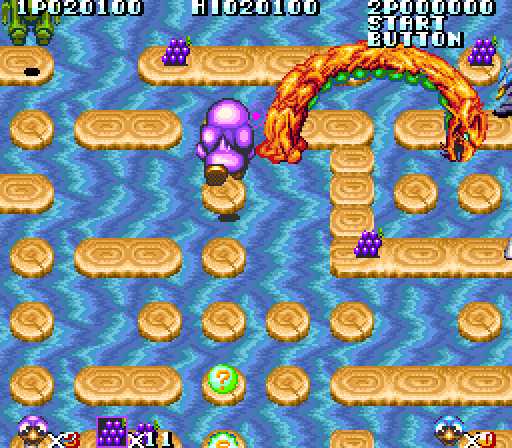 There are more fruits placed with only one viable pathway to reach them, and more focus on riding the easily-misjudged moving platforms, but in many arcade games I’d expect the action to reach this level of difficulty around the end of the second stage, not just before the final boss. It helps that (as far as I’m aware) Super Duck doesn’t have a time limit, and in most case a lot of the challenges can be overcome by staying patient and waiting for the enemies to scuttle off to a different part of the map. 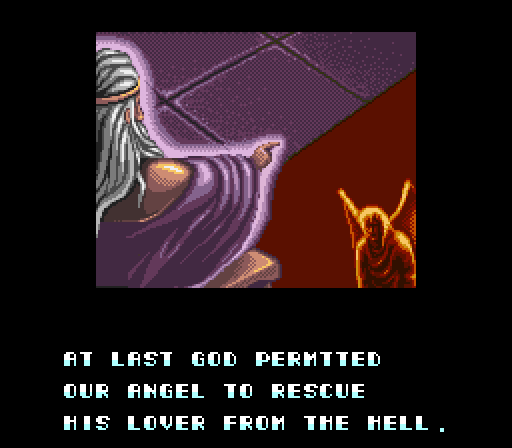 And now, the climactic battle against Satan himself. He’s a dragon, which is fair enough. Satan gets called "the dragon" all the time, right? Seems like a perfectly acceptable form for the devil to choose, although given the other monsters I’ve been fighting against it’s a little… bland. I’ve spend a lot of time playing a lot of videogames where I’ve fought a lot of dragons, you know? He’s definitely not as engaging as Aeroplane Man or The Floating Turd. Get to the side of his head wherever possible and use your fire breath over and over again until Satan is defeated. He doesn’t put up much of a fight, honestly. Kidnapping this duck’s human girlfriend was little more than a passing fancy, it seems. And so the lovers are united. Neither of them look particularly thrilled with this turn of events. Maybe it was better to co-rule in Hell than date in Heaven. At least our hero isn’t a duck any more, although this does mean he’ll have to go back to holding in his farts whenever people are around. Personally I found Super Duck rather interesting, although I’d fully understand if you did not. It’s a very middle-of-the-road arcade platformer in a style that would probably have felt a little bit dated when it was released. There’s nothing exciting about the gameplay but there’s nothing terrible about it either. But it’s also a tale of ducks, jealous devils and flatulence, with some pleasingly bizarre monsters and a mysterious relationship to other, possibly unreleased game, so it ended up holding my interest for longer than I thought it would. Forty minutes rather than ten, that’s quite the achievement! Up and at them with Bartman Meets Radioactive Man! The thrill of wallpaper paste in Poster Paster! The Force is tepid with Super Star Wars! 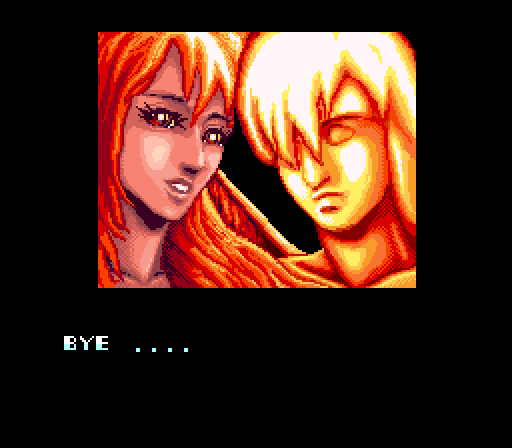 This game is very admirably devoted to its plot, I'll give it that. The cinematic sequences kinda look like something that belong in one of those old but really hard but dramatic shooters, like Wings of Wor or something. Yes, the cutscenes are rather intense for a game about a farting duck, credit to the designer that somehow had to combine the two elements together. I think that octopus is wearing an army helmet? That would explain the stars. I suppose it *could* be wearing a helmet. It'd make as much sense as anything else in this game. Even if Superman could only shoot salty water out of his eyes, there's still a non-zero chance of him still being effective. I say this as someone who has put in 1 game's session of Campaign for North Africa (~1500 hours) into The Binding of Isaac. "The Satan". In a game with a mostly very cartoony style. I know this obviously isn't true, but I'm still going to mentally consider this game a prequel to The Ninja Kids. I think I'll go with "somehow part of the Dynamite Dux universe." This really looks like the developers started making a hell-themed platformer and in the last month decided to make a drastic thematic left-turn, but didn't want to scrap all the work they had done previous, so, uh, yeah, the angel is a duck now, have fun. I'm pretty sure that's exactly what happened.